OTTAWA -- The federal government is making targeted spending commitments aimed towards millennials, workers, and seniors in their 2019 pre-election budget, and are continuing to spend while posting deficits, with still no path to balance. The 2019 budget, titled "Investing in the Middle Class," is the last of this government’s mandate. It includes a new skilled-training program, a plan to lower the interest rates on student loans, new initiatives related to seniors’ savings, and new measures for first-time home buyers. The federal Liberals are projecting a $19.8 deficit in 2019-20, higher than the $19.6 billion projected during November’s fiscal update. This figure includes the $3 billion contingency fund for 2019-20, otherwise considered an adjustment for risk, or rainy-day fund. During the last federal election the Liberals pledged not to run deficits over $10 billion and said they would return to a balance by 2019, a promise now not on the fiscal horizon for at least the next four years. The most the government is projecting the deficit to drop is $10 billion by 2023-24. In that year, the deficit is projected at $9.8 billion. With tax revenues increasing, instead of chipping away at the deficit, the government has announced $4 billion in new spending in 2019-20, with total new spending over the next six years amounting to $22.8 billion. In his remarks to reporters inside the budget lockup, Finance Minister Bill Morneau touted the 900,000 new jobs created over this government’s mandate and record low unemployment rate. He bolstered the Liberal’s approach of deficit spending, saying the Canadian economy is on “good fiscal track,” but noted there is more to do. “We know that Canadians still feel anxious about their future, worried that the next generation will be able to do as well as the current generation, and that’s the frame for our budget this year. We’ve taken a look at some of those things that are causing people to worry,” Morneau said. Canada’s federal debt as a percentage of GDP is projected to incrementally decline over the next five years, from 30.7 per cent in 2019-20, to 28.6 per cent in 2023-24. Overall, economists CTVNews.ca spoke with described the 2019 budget as one that was future-focused, with a little something for a lot of people, but no blockbuster initiatives. "I don't think any of these measures are big enough to have much of an economic impact," Matthew Stewart, who is director of economics at the Conference Board of Canada told CTVNews.ca. "The biggest things missing were items around improving business investment and addressing Canada's lacking competitiveness," Stewart said, adding that while the deficit is projected to decline, it’s a risk to continue to spend rather than save, should the economy take a downturn. Former Parliamentary Budget Office Kevin Page said that while it is very clear it is a pre-election budget, "there are no signature initiatives." However, he said there are enough little things in it to allow Liberal MPs to head out with a refreshed slate of announcements for their ridings or regions over the coming months. The condition attached to much of the promised new spending is that it is contingent on the Liberals getting re-elected. This sets the stage for voters to have to weigh the value of what’s being promised, in contrast to the other parties’ approaches that are starting to take shape,when they head to the polls in less than eight months' time. Among the biggest-ticket items contained within Budget 2019 are changes aimed at improving the economic security of low-income seniors, and lowering the interest on Canada Student Loans and Canada Apprentice Loans. The government wants to make the prospect of going back to school, or gaining new skills more appealing for people between the ages of 25 and 64. The Liberals are proposing to do so through a new Canada Training Benefit that will to chip in a small amount towards the cost of training fees. It’s a credit of $250 a year that can accumulate to help pay for future training, up to $5,000 over a person’s career. The federal government is also setting up a new Employment Insurance Training Support Benefit that will allow people who want to get more training to take four weeks every four years to do so, without coming up short on living expenses. To qualify, workers need to be making between $10,000 and $150,000, and it would result in paid leave at 55 per cent of weekly earnings. Though, this promise isn’t set to kick in until the end of 2020. As hinted in advance of today’s budget, the government also wants to make it easier for young people to buy their first home. How they will aim to do this is through a targeted new support for first-time home buyers. This First-Time Home Buyer Incentive will allow buyers -- who have the minimum down payment for a mortgage -- to finance 10 per cent on a new home or five per cent on an existing home through a shared equity mortgage with the Canadian Mortgage and Housing Corporation. Doing so will lower buyers’ monthly mortgage payments by up to $228 per month and applies to households with combined incomes lower than $120,000 a year. The 2019 budget takes the “initial steps” towards implementing a national pharmacare program in the coming years, with $35 million over four years to establish a Canadian Drug Agency and $500 million beginning in 2022-23 to improve access to drugs for rare diseases. It also lays out more than 100 targeted and small-ticket items aimed at regions and other niche voting blocks, including supply managed farmers and rural Canadians. The supply management pledge is sizeable, promising $3.9 billion for Canada's supply-managed dairy, eggs, and poultry farmers who have been impacted by recently negotiated trade deals like the new NAFTA and the CPTPP. The government is making an income protection program eligible, and is promising a measure to protect the value of quota investments. This includes a Quota Value Guarantee Program. And for rural voters, the government is promising that by 2030, 100 per cent of Canadian homes and businesses will have access to high-speed internet, something many in rural Canada are still without. This promise comes with up to $6 billion over the next decade in spending to see this promise come to fruition. 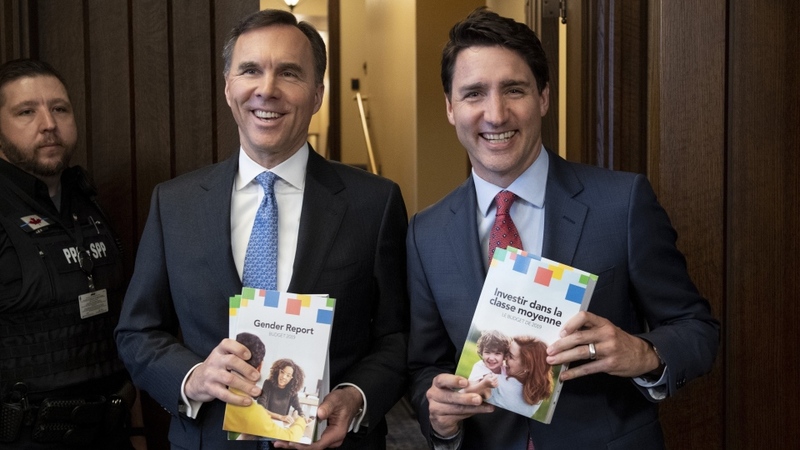 Continuing with an approach initiated in the 2017 federal budget, the 460-page document includes a gender-based analysis of the impacts of all initiatives contained within the budget. The government estimates that 80 per cent of measures impact men and women equally. "Our government has been clear since day one. We are going to invest in the middle class and in the things that matter most to Canadians: good jobs, strong communities, a clean environment and better opportunities for future generations. We are going to make these investments to grow our economy for the long term, while we bring the books back toward balance," Morneau said in his budget speech. Tuesday's budget tabling came amid considerable procedural wrangling in the House of Commons related to the ongoing SNC-Lavalin scandal. The opposition vowed earlier in the day to delay the budget on account for Liberal MPs shutting down the House Justice Committee probe into the SNC-Lavalin affair without allowing Jody Wilson-Raybould to testify again. This had all on the Hill preparing for a vote on a private member’s bill to be called on the request of the Conservatives minutes before 4 p.m. when the budget was set to be tabled. 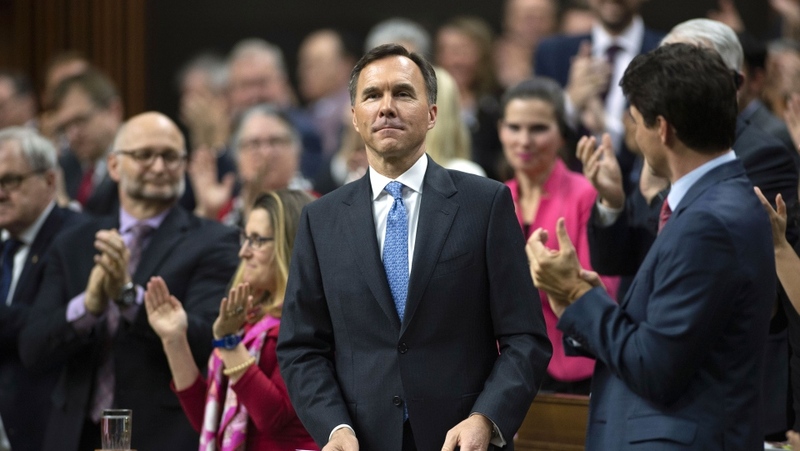 But minutes before the vote was called, Morneau appeared in the House and tabled the 2019 budget. Instead of then launching into his budget day speech, he stepped out to the foyer where media were set up for budget day specials and began doing interviews with various outlets, while the bells were ringing for the vote. During the vote, several opposition MPs voted both for and against, and then were allowed to stand in the House to address their voting error. It was then that one by one these MPs used their time to say “let her speak” referring to Wilson-Raybould. After a volley of other procedural measures, Morneau was able to launch into his formal budget speech. He was shortly drowned out by the opposition, who were banging on their desks and making other oral noises that prevented Morneau from being audible during his delivery. This continued for several minutes, interrupted by various interjections from the Speaker, and the sound of an Amber Alert ringing on MPs' phones. Then, 20-minutes into the speech, Conservative Leader Andrew Scheer rose on a point of order and decried the Liberals tactics as "an assault on democracy." Conservative MPs rose from their seats and walked out of the House, and Morneau continued. It took him 50 minutes to complete his speech, concluding just before 6 p.m.
"It's disappointing that the Conservatives actually don't care and don’t know what’s in the actual budget," said Prime Minister Justin Trudeau on his way out of the House Tuesday evening. He said his final budget before the campaign is one that includes "the kinds of things that Canadians know they will be better off for in the coming years." On his way out of the Commons, flanked by many members of his caucus, Scheer said that while the Liberals tried to present a budget as if it was "business as usual," it isn't and that’s why the Conservatives acted the way they did. "Today's budget is part of the continuing coverup. This budget is not a serious fiscal plan for the country… This budget has no legitimacy and we could not legitimize it by remaining in the chamber," Scheer said. 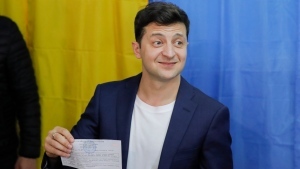 He vowed to continue to use any tools they can to highlight the SNC-Lavalin affair. "We are prepared for anything," Scheer said. Asked if the Conservatives have a plan to return to balanced books, Scheer said the Conservatives would restore fiscal responsibility, and pivoted to criticize the government for their continued deficit spending. NDP Leader Jagmeet Singh said the budget "gives crumbs" to Canadians after the Liberals have given "the entire pie" to wealthy Canadians over their mandate. He said the budget did not address the urgent problems Canadians are facing. "This budget does not make life better for Canadians who continue to struggle," Singh said. Speaking about the delay tactics and raucous behaviour in the House, he said the protests are not relevant to the issues of the budget, but are reflective of the dissatisfaction among Canadians who he says are still concerned about the allegations at the heart of the SNC-Lavalin scandal: political pressure and attempted interference in a criminal trial. Green Party Leader Elizabeth May also picked up on the small dollar amounts attached to many of the announcements and noted that some of the marquee announcements, like lowering student loan interest rates, will require legislative changes to implement. "Given the timing of the legislative calendar, there's no chance that most of these things can be done before the next election. Though, it is likely that all of these changes that require legislative change will be wrapped up into an omnibus budget implementation bill, and passed that way. Speaking to the acrimony in the House, May said that the SNC-Lavalin "still hangs over this Parliament," and she anticipated the partisanship to only increase from here on out. Addressing the Liberals' broken promise of a balanced budget, People’s Party Leader Maxime Bernier said it was "irresponsible," because it’ll be future generations that will have to pay for it. "They want to buy votes and that's not the way to do politics -- with people's money," Bernier said. He also was not impressed with the new measures for the supply management sector. A one-time infrastructure top up of $2.2 billion to municipalities through the Gas Tax Fund. A $5,000 federal incentive to purchase zero emission vehicles like electric or hydrogen-fuelled cars with a retail value of less than $45,000. $739 million over five years to keep up the promise of eliminating all drinking water advisories in First Nation communities. $1.2 billion over three years for Indigenous child welfare services. $1.2 billion over five years for border security and to assist in processing asylum claims. $136 million over five years to assist injured veterans and another $150 over five years for their families. $550-million over the next five years towards fixing the Phoenix pay system including $21.7 million to be spent in the current fiscal years on “urgent” pay pressures. $508.6 million over five years for RCMP policing operations. $30.2 million over five years towards agencies tasked with shoring up our elections from cyber threats and foreign interference. This includes $19.4 million for Canadian Heritage to launch a "Digital Democracy Project" to "support research and policy development on online disinformation" in Canada. $151.2 million over five years to improve emergency management related to natural disasters. An additional $2 million a year towards protecting community gathering places from hate crimes.